I have been wanting some Rosewater by Verna Mosquera or some Pretty Potent by AMH! Thanks for the giveaway! I love sketch… I really should start hoarding more of it! At the moment I’m filling up a cart at FQS with some of the new Christmas fabrics (loving the new Basic Grey one). I have an idea of what I want to make with a F8 bundle I already have but I need a few extra fabrics to make it work — eyeing off Grunge Basics for a background. Yum yum! I’d buy Kaffe Fassett fabrics – you can never have too many of those! Thanks for the opportunity. Will link up a photo in the morning when I can take a good photo. I’d buy some cotton and steel basics, of course! I’m a big fan of the Sketch. Fabrics & am running low on my faves so I’d get some of the colours available at Pink Castle Fabrics. I already follow you via email subscription. Thanks for the chance to win. I’d buy some AMH baby! I’m stocking up, you see 🙂 Love that you are stocking up too! That canary yellow has me hypnotised (in a good way). I’ve never shopped at Pink Castles Fabrics before… but thank you for introducing them to me..
I’m in need of some Kona solids, I need some ivory, multiple greys, and I love the cerise. . 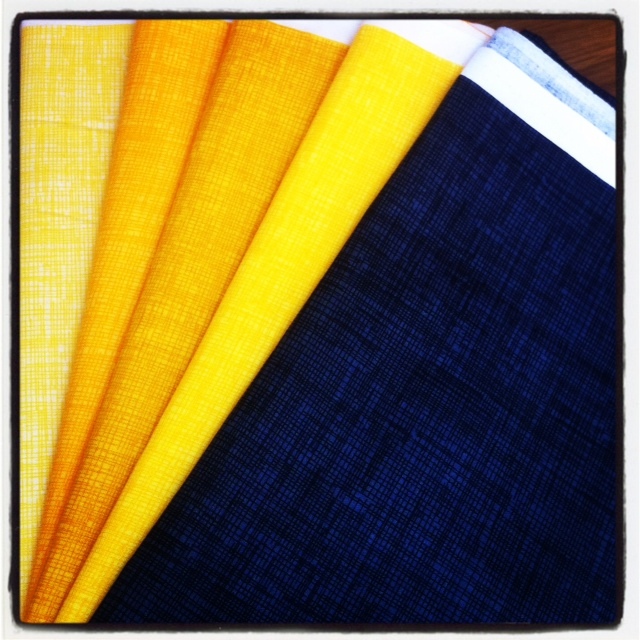 Although, I’m really liking those yellow sketch fabrics. Every time I see sketch I say I want some of that, but I really need to stock up on my Essex linen! I love Sketch! I’d love to go shopping at m is for make and get some arrow prints and some of those lovely honeycomb dots! I would use it to preorder some Cotton and Steel basics or Moonlit by Rashida Coleman-Hale! I have a big wish list, but on the top of it is some Kona solids for a project I’m doing. I need some Ash, White and Iron. I think I’d pick up some Lotta Jansdotter. I *love* her style. I’m a huge Orla Kiely fan, and LJ seems to have the style closest to her…if only Orla made quilting cotton…**swoon**! I used some sketch in a quilt for my daughter, and I love it! Can’t wait to see what you do with it 😀 New reader here! i would get some batiks from the fat quarter shop. Those are some great yellows! Ironic, my post this week was about adding yellows to my stash. 🙂 Thanks for hosting. I love sketch fabric line – I have a ton of fabrics but always find myself needing something more to finish up a project…something that I don’t have of coarse. I have been wanting some squared elements for a long time now – must grab some before it is all gone! Hi! How lucky you are for that special delivery! Right now I am anticipating getting my hands on the Heather Ross unicorns. Oh, love the Sketch fabric! It is really great to get fabric packages in the mail, and if I happenend to win I would love to order some rulers and a FQ bundle of Sweet as Honey, adorable! I would absolutely buy more of the Pearl Bracelets Tonals. Probably in Black and Blue, Robin’s Egg, and Dark Orange. Or at least those would be my first three choices. Thanks for hosting and the giveaway, NIcholas! I browsed through the bundles at the Fat Quater Shop and saw a bunch I like! I don’t have any Color Me Happy yet, and they also have some really great blogger curated bundles that would be fun too! I hadn’t seen Sketch before and love it!! That’s what I would be getting if I won!!! Thank you for the great giveaway! Color me Happy has me hooked at the mo, and pretty much impossible to get the whole line here in Blighty. I’ve never tried buying from the US online shops, cos I am so scared of the delivery, VAT, customs charges thing …. but your giveaway voucher may just be what I need! Thanks for the chance! I’m waiting on the new Denyse Schmidt line Hadley, but I’m sure I’d have to buy something else in the meantime because I’m so impatient. Thank you, what a nice giveaway. Sure, I’ll follow along! Lover of sketch here. Both of the drawing and fabric variety. I’d be hard pressed to pick. Gah! Maybe some of the new shimmer pearl bracelets, or the new (possibly last? gasp!) Ghastlies line, Bee my honey, Arizona, Chillingsworth, Alexander Henry Haunted House, some voiles. Okay, your post just made me grin, ear to ear! I love a good themed post, especially one about our gal Dorothy! Oh, the irony! You are so special, mister! Don’t enter me in the giveaway, obvs, but I would totally be buying a bolt of Art Gallery in black and white. I think I only want to use them now for my solids. You’ve been a fab host, and I’ll gladly let you do it again! Oh my! I’d like to thank the Academy…actually no, I did it all myself! In all seriousness though, thank you! It’s been an honour and I’d be more than willing to step in for you any time. I would love some of those timeless treasures in a charcoal, black or grey. Thanks for the chance to win. I’d buy some Essex linen and whatever Architextures reprint I can find! Thank you again!